Electric Vehicles – Passing Fad or Paradigm Shift? There has been a lot of discussion about the electric vehicle revolution and what its impacts will be. Are EV’s gaining traction or getting stuck in the mud? Will they quickly replace internal combustion powered vehicles or will they represent a “green” niche market for decades to come? Will manufacturers be willing to lose billions of dollars on EV development forever or will they eventually make most of their profits from this technology? The questions about EV’s go far beyond the impact on the automobile manufacturing industry (which is one of the biggest industrial concerns in the world). The impacts upon electricity utilization and the grid, both positive and negative, will in many ways shape future decisions about generation and grid management. I am going to explore a few of these questions in this blog posting. Firstly, what is the current status of EV sales worldwide? In trying to answer this question we are immediately faced with another question. What is an EV? One definition would be that an EV uses an electric motor as its primary propulsion system. Such a definition would probably exclude the Toyota Prius and other Hybrids which normally use the internal combustion engine for motive power and reserve the electric motor for very low speed driving (under 25 miles per hour) and more importantly to boost power during acceleration. The Chevy Volt would meet that definition as it only uses an electric motor to power the vehicle even though it has an internal combustion engine which can generate electricity to drive the engine when the battery pack has discharged to a certain level. In my blogs I always stress that we need to be looking at the ultimate goal which is to eliminate our use of hydro-carbons, including gasoline. Simply reducing our use of gasoline is not sufficient. By continuing to use an internal combustion engine for long distance travel hybrids and even the Chevy Volt avoid the most difficult issue facing EV adoption. Namely, an unacceptably short range under normal driving conditions. The Chevy Volt can travel approximately 45 miles on battery power alone under good conditions. The Plug-in Hybrid version of the Toyota Prius is rated at 14 miles. Of course both of these figures can be considerably less in cold winter conditions or under heavy load (for example going uphill for a long distance). The average commute for U.S. workers is about 16 miles so the Volt would probably work using electric power only. The Prius would definitely not. Neither would work for many weekend trips under electric power alone. For these reasons I am not going to include either plug-in hybrids or the Chevy Volt in my definition of Electric Vehicles. I will discuss vehicles that are practical, electric power only vehicles that have no gasoline tank. These vehicles are, in my opinion, the true future of the automobile. Using that definition there are only two mass-market EVs available today. 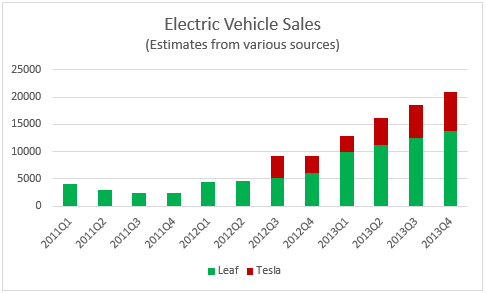 The Nissan Leaf and the Tesla Model S.
Although it is difficult to get accurate quarterly sales figures the graph below represents a reasonable estimate of how sales of these two vehicles have grown since the launch of the Leaf in 2011 and the Model S in mid-2012. There are now more than 80,000 Leafs on the roads of the world and about 30,000 Tesla Model S’s. This number has been increasing at a steady pace, notably due to a price decrease by Nissan at the beginning of 2013 and by increasing recognition of the Model S as a vehicle that has dependable long-range capability. The EPA estimate for “average range” for the Leaf is 75 miles. That will certainly handle most commuter trips and some longer trips. The Tesla Model S is EPA rated at 265 miles range with the largest battery available in 2013. The Model S can also be equipped with super-charging capability which is able to fully recharge the battery in less than an hour. The large battery range and the existence of super-charging stations make long road trips with a Model S quite realistic. 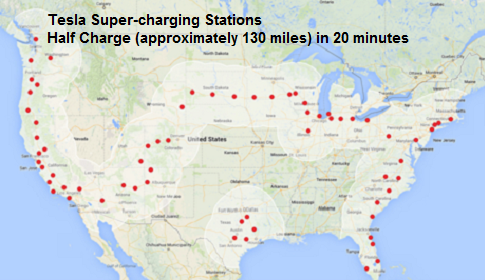 A map of the super-charging stations in place at the end of 2013 is displayed below. EPA ratings and marketing brochures are one thing. Real world experience can be quite different. When I began to write this blog posting I started looking out for EV’s in my home city of Vancouver, B.C. After a few days I caught sight of a Tesla (I probably missed a few Nissan Leafs which are harder to differentiate from other similiar sized vehicles). I was able to follow the Tesla into a parking lot where the owner, Barry Yates, kindly agreed to an impromptu interview. Barry purchased his vehicle the first day they were available locally. He regularly travels to Whistler Mountain for ski trips, a distance of about 70 miles. The road to Whistler climbs uphill to an elevation of more than 2,000 feet and has to be done in cold, winter conditions. Barry told me that he never has trouble making the round-trip on a single charge, partially because there is regenerative charging on the trip down on some of the steeper declines. One thing that surprised me was that Barry felt the Tesla had good winter road handling despite being a rear-wheel drive vehicle. The large battery distributes the weight very evenly between the front and rear wheels which probably helps. Barry has installed snow tires which is a normal requirement for all vehicles travelling to Whistler. Barry has also made a few trips to Seattle, Washington, about 150 miles from Vancouver. He has been in the habit of stopping at a Super-charging station at Burlington, Washington, about half-way to Seattle. The 15-20 minute stop tops up his charge so that he doesn’t have to worry about being low on power as he gets closer to Seattle. Anyone that has been in the traffic jams on the I-5 can appreciate that. What is the bottom line? I think a fair evaluation would say that currently available technology can produce a vehicle that meets the everyday needs of most North Americans. But that does not guarantee that the adoption of EV’s will be quick or smooth. The Tesla Model S is an impressive vehicle. However, the pricetag is also impressive with the long range version costing more than $70,000. The Nissan Leaf, at about $30,000 is more manageable particularly after various rebates and incentives are accounted for. But for a vehicle its size it is not inexpensive. There are very significant savings to be had with a true EV with regards to fuel costs. Barry Yates indicated that his home electric bill had gone up about $50/month after installing a 220 V charging system for his Tesla. However, his fuel bill went down more than $500/month. An annual savings of something like $5,000 isn’t a bad return on an investment of $70,000 – as long as you have the $70,000 to put into a vehicle. Prices will come down as the technology matures, as manufacturers start to achieve economies of scale, and as inevitable increases in the price of gasoline make the returns more attractive. So in my opinion the transition to EV’s is underway and won’t slow down anytime soon. Given that new reality it would be wise to consider some of the non-automotive consequences that will likely result from this transition. First, what will the impact of EV’s be on electrical load factors? Like most things when it comes to load factors the impacts are not that easy to predict. However, it is likely that a typical charge cycle will extend from the time a person gets home from work until the battery is fully charged. 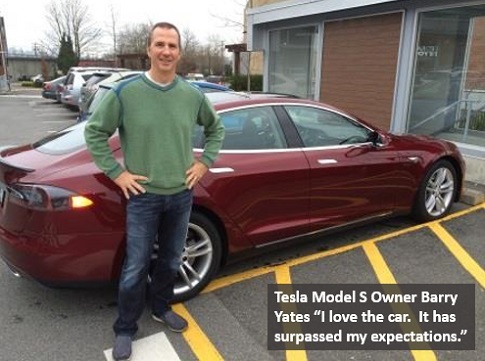 Barry Yates indicated that charging his Tesla takes about 10-12 hours on a 220 V outlet (the same type used for a clothes dryer or oven). As the number of EVs increases this new source of load will start to have an impact on demand curves and the grid. In Northern areas where the peak demand is in winter this will be particularly problematic. The period 5:00 pm to 8:00 pm is already a high demand timeframe and adding EV charging will definitely result in new record demands unless significant changes in energy usage can be implemented. In the south where summer air-conditioning results in peak demand the impact will not be as severe. The main impact will be to extend the typical peak demand period (2:00 pm until 5:00 pm) later into the evening but it is unlikely that higher peak demand would result. For workers with longer commutes there will possibly be a need to charge vehicles after arriving at the workplace. This should not be much of a problem because the morning peaks are not as high as afternoon and evening peaks regardless of the season. Based upon this very preliminary high level assessment it would probably be wise to try and delay home EV charging until later in the evening. A start time of 11:00 pm would still provide a long enough charging period for most users. As EVs, like other appliances, become “smarter” it may well be possible for them to be programmable to delay the charging cycle until a specified time. Perhaps, ala Siri, this could be done by voice command. “Car – start charging at 11:00 pm” – sounds both futuristic and creepy at the same time! In anticipation of an eventual fleet of hundreds of thousands of EVs, considerable research has been conducted into how this resource can be used for grid stabilization and frequency smoothing services. A number of papers published by scientists from the National Renewable Energy Laboratory (NREL) have discussed implementing real time demand response by controlling when the EV fleet starts and stops charging (see for example “Value of Plug-in Vehicle Grid Support Operation”). Of course this would depend upon vehicle owners allowing the local grid operator to control the charging functions of their vehicles. It also assumes a reliable grid-toEV communication infrastructure and protocol was in place. There has also been some speculation that EV batteries could be used as a source of electricity for the grid when sharp drops in generation capacity occur (as a result of changing weather patterns which impact renewable generation sources such as solar or wind or as a result of an unexpected plant/unit shutdown). This is much less likely because it would require that whatever outlet the EVs were plugged into was capable of receiving electricity as well as delivering it. Finally, there have been proposals to combine used EV batteries into an array that could act as utility-scale energy storage, capturing excess electricity at night or other low demand times and delivering it as a peak demand source. I discussed this research in one of the first postings in the Black Swan Blog. It was more than 100 years ago that Henry Ford’s Model “T” rolled out of a factory in Detroit Michigan signalling the beginning of the end for steam powered automobiles. Those were radical times; the internal combustion engine and the assembly line combined to bring affordable transportation to the masses. Our love affair with the automobile has never waned since that time. The change we face today is no less radical. This revolution will put you in the driver’s seat of vehicles that move so quietly they can hardly be heard; they will not pollute our atmosphere; they will not rely upon the extraction of an energy source that cannot be replenished. I don’t know about you but I can honestly say that I can hardly wait until I have managed to trade in my 7 passenger Town & Country (can you really call a 4,000 lb vehicle a mini-van?) for an EV – maybe even a Smart Bike! Having spent more than 25 years in the oil and gas industry I have seen my fair share of hydro-carbon price fluctuations. So it has not come as a complete surprise to me that the “shale gas” phenomenon has had such a dramatic impact on North American Natural Gas prices. At the beginning of the 21st century Natural Gas prices were about $4.00/Million BTU and thereafter they rose rapidly to $8-$10/Million BTU in the years 2005-2007. The economic crisis that started in the fall of 2008 coincided with increasing production due to the success of shale gas development which translated into a very rapid decline in Natural Gas prices to just over $2.00/Million BTU in 2012. Since then prices have recovered somewhat to about $4/Million BTU. 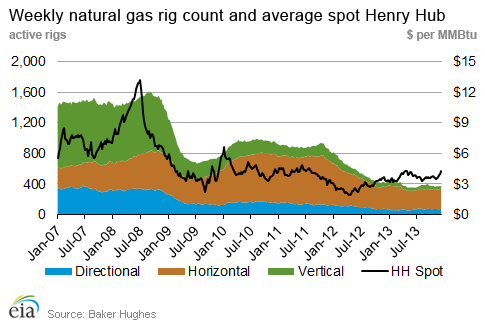 The low prices since 2008 have resulted in a very predictable decline in the number of drilling rigs exploring for new natural gas reserves. The impact is displayed in the graph shown below. There are a few very striking features of this graph. First, the almost total elimination of vertical drilling rigs is interesting. In traditional gas fields widely spaced vertical wells are able to drain the reservoir efficiently because the gas flows quite freely through the rock. In technical terms this type of reservoir has relatively high permeability. Reservoirs that consist of rocks with lower permeability cannot be produced very efficiently with vertical wells. It is much more efficient, although also much more expensive, to develop these reservoirs using horizontally drilled wells as shown below. As horizontal drilling grew more common in the late 1990’s it was possible to economically produce reservoirs that previously had been difficult or impossible to exploit. These so-called “tight gas” reservoirs became an ever more important source of Natural Gas in North America. Because “tight gas” does not flow freely through the reservoir rock these wells produce a lot more gas in the first year of production than they do in subsequent years. In the industry this is known as the production decline rate. While a decline rate in a high quality traditional reservoir might be 1-2% (allowing fields such as the Groningen in the Netherlands which came on-stream in 1963 to produce for an estimated 80+ years) tight gas can decline at 10-20% or more annually. 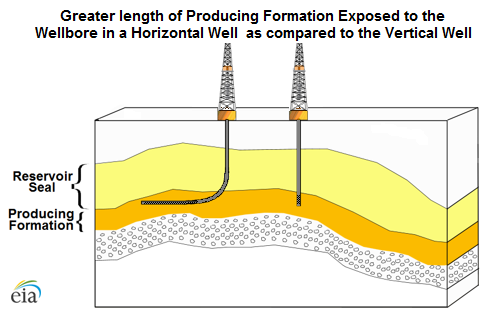 The “shale gas” phenomenon is a variation on “tight gas” which involves the injection of high pressure fluids and chemicals into a horizontally drilled well to break apart or “fracture” the reservoir rock near the well bore. After years of research & development fracking techniques have become standard industry practice and reliably result in significant production from shale reservoirs. The exploitation of “shale gas” has increased dramatically since 2005 resulting in a glut of Natural Gas in North American markets. This in turn has driven down the price of Natural Gas to near historic lows in constant dollar terms. The Energy Information Agency forecasts that Natural Gas production in the United States will continue to increase for the next two decades based upon ever-increasing production of “shale gas”. They also forecast only modest increases in Natural Gas prices to the range of $7-8/Million BTU by 2035. I am not convinced that this scenario is at all realistic. The steep decline in drilling activity over the past 5 years is going to catch up with us at some point in the near future. It usually takes a few years to tie new gas wells into the distribution system and put production facilities in place. Therefore there is a lag between drilling activity and production. 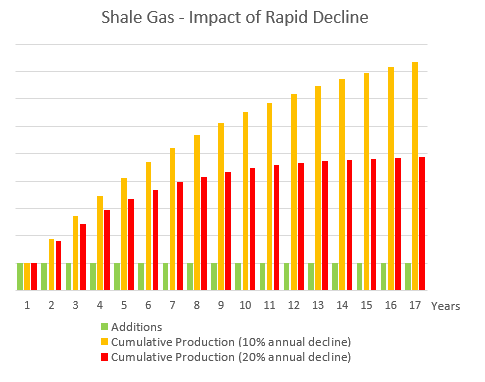 The other difficult obstacle to overcome is the impact of rapid decline rates on total shale gas production. Assuming a constant amount of drilling activity and discovery success the total production flattens out after about 15-17 years with a 10% annual decline and after only 10 years with a 20% decline, as shown in the graphic below. As the amount of shale gas in production increases the annual decline eventually is equal to the annual additions made through drilling for new reserves (Gary Swindell has analyzed production decline rates in great deal in a paper published in 1998 and extensively updated in 2005). As noted above drilling activity has not been constant over the past 5 years but has actually decreased pretty dramatically. It follows that there will probably not be a large increase or in fact any significant increase in shale gas production over the next five years. At the same time the older gas reservoirs will continue to decline at a slow rate as they have for decades. Putting all these factors together it seems likely that Natural Gas supplies in North America will tighten up somewhat in the next few years. This dynamic of gas “booms” and “busts” is one we have seen many times before and is primarily driven by commodity prices. When prices reach lows such as they hit in 2012 drilling activity dries up, supplies tighten due to declines and prices go up. Eventually prices go up enough for exploration companies to be willing to renew the search for new gas reserves. That process takes a couple of years during which supplies tighten even more and prices go up further. Eventually the balance swings in the opposite direction and supply meets or exceeds demand and prices soften. The implications of this cycle are quite worrisome when put in the context of electricity generation. The MACT regulations will force the closure of more than 40 GW of coal-fired generating capacity in the next few years. This is firm and dispatchable generation that can be called upon at peak demand times. No amount of solar and wind can replace that loss reliably without massive amounts of affordable energy storage which does not exist. Utilities are struggling to come up with plans to replace the lost coal-fired generation capacity. In many cases the current low prices are pushing utilities towards the construction of Natural Gas fired plants. That cannot be considered to be a negative choice. Natural Gas burns more cleanly than coal and produces about half of the CO2 per Watt of electricity generated. But there are a couple of problems with a wholesale switch to Natural Gas. For those truly fearful about climate change then the fact that Natural Gas produces CO2 will continue to be a problem. Probably more important on a daily basis will be the potential impact on utility rates if Natural Gas prices escalate significantly. There is a reason that more than half of the electricity generated in the United States up until the turn of the century came from the burning of coal. Coal was and remains the least expensive energy source available. Coal can also be stockpiled at a generating plant. That may not seem important but congestion in pipelines can be a real problem when temperatures drop and both residential users and power plants are consuming Natural Gas at the maximum rate possible. That was an issue in the NE part of the continent during the recent “Polar Vortex” storm. My fear in all of this is that utilities will spend 10’s of billions of dollars building Natural Gas plants which will help drive prices up – and those price increases will be passed on directly to electricity consumers. My hope is that this rather bleak future of higher prices and continued CO2 emissions will cause utilities and governments to consider putting more time and money into developing affordable energy storage solutions. If we could store energy on a very large scale we could time-shift solar and wind generation to match our demand patterns. That is, in fact, a requirement before we can move completely away from the burning of hydro-carbons to generate electricity. There are other measures that we can pursue – many of which are described in my Sustainable Energy Manifesto.